Stella Young’s story brings to mind two TED Talks that on the surface could not be more different, but share a common thread. Geena Rocero is a young woman who made a conscious choice to inspire with her identity. As a kid, she knew she’d been born into the wrong body, and she looked up to role models who helped her grow and step into her own true self — from her friends at local pageants to her supportive mom and family. But a lot of kids, she knows, don’t have that support — far from it. So last year, she made the choice to reveal herself as a transgender woman, and by doing so become a role model for the next generation of kids seeking their own true identities. She practiced hard, for months, to tell her story to the world for maximum impact. And she and her team worked just as hard to connect people with resources and actions, so they could do something real with their newly inspired energy. 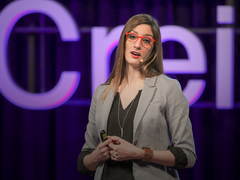 Her TED Talk, Why I must come out, had the deliberate goal to inspire, and she did — helped along by her confidence and honesty, and backed up by a website full of resources and connections. Another talk, from TED2012, on the surface has no connection at all. It’s from a technologist who’s making the craziest coolest electronics out of paper and ink. Dr. Kate Stone gave a rocking demo of paper DJ decks, and brought the house down with her open sigh of relief when the pre-release technology worked onstage. She hung out and talked until the wee hours, and in conversations she was open about her identity as a transgender woman. But it was her choice not to make it a public talking point, choosing to focus on her work and her new technology. Both these choices are the right ones. This should go without saying — but as Young’s talk reminds us, it doesn’t yet. Plenty of good people offer their stories as inspiration because they know personally what a dose of inspiration once meant to them. The world needs inspiring now and then! But plenty of other good people, with stories just as interesting, choose to live their lives. Stone later decided to discuss her identity in public more widely, after an accident left her in a hospital bed for weeks on end — and prey to tabloid headlines that played up her gender identity without her consent. She made a decision to use her new public platform to help raise awareness of transgender issues, did some chat shows and talked with some blogs. But she’d still much rather talk about her work, which is progressing quite nicely, thank you. She, like all of us, gets to decide if she’s an inspiration or not.